It’s almost impossible to imagine now, but the area that Bunhill Fields Burial Ground occupies was once located on a moor that stretched between the London Wall and the ‘village’ of Hoxton. How times change. Today the crowded graves abut modern apartments and offices, while traffic from City Road is a constant presence, despite the surprisingly tranquil atmosphere the site somehow still manages to maintain. Burial grounds have in fact been a fixture – in various forms – in this district since Saxon times. 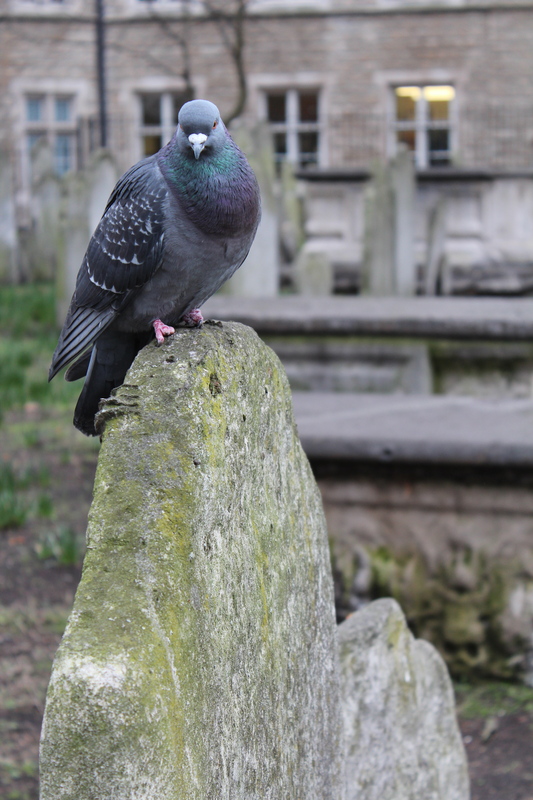 Bunhill Fields’ name derives from ‘Bone Hill’, possibly in reference to a period during the mid-16th century when literally cartloads of bones were brought here to free up space in St Paul’s charnel house and vault. 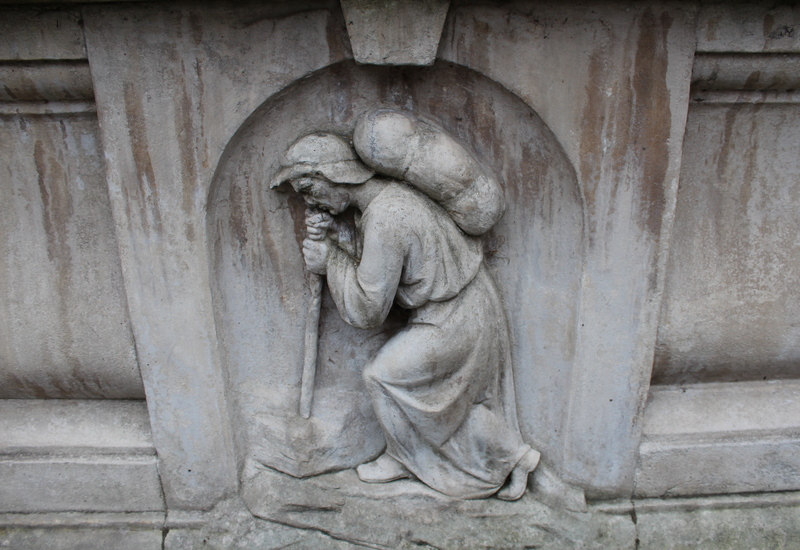 Another influx took place in 1665 when plague victims were interred here by the City of London – it was at this point that the Bunhill Fields Burial Ground was officially established. 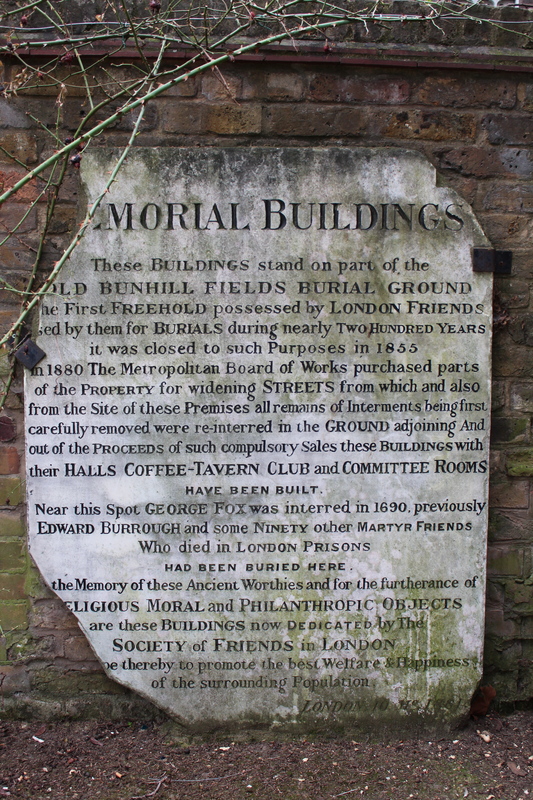 As the ground was never consecrated, it became popular with nonconformists and is the last resting place of many famous dissenters, including William Blake and John Bunyan. As such, many of the graves are more plain and simple in design than you generally see in many of London’s older cemeteries. Wesley’s Chapel (which has its own small burial ground, much of which is hidden away at the rear of the complex) can be found to the East just across City Road, while the old Quaker Burial Ground is across Bunhill Row to the west, forming a significant zone for London’s nonconformists. Not much is left of the Quaker Burial Ground – now Quaker Gardens – which suffered massive bomb damage during the Second World War. The 1881 Quaker Meeting House is still in use though, and is now the only remaining structure from the Bunhill Memorial Buildings (it can be found on Quaker Court). 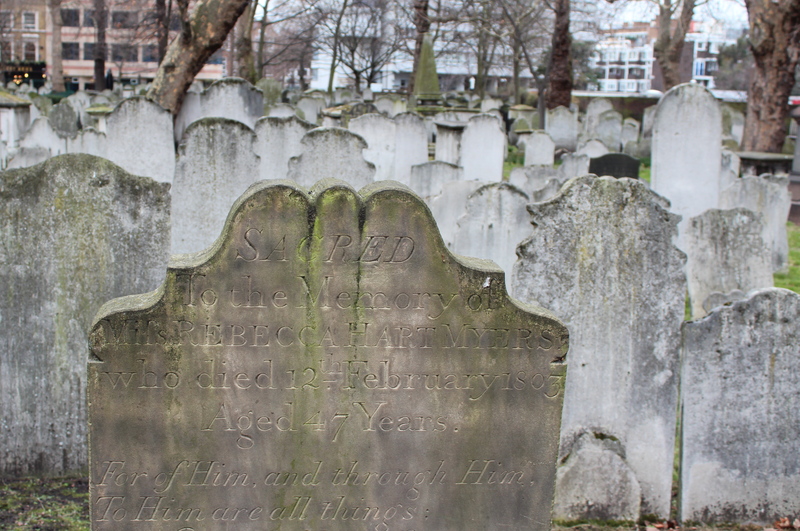 Bunhill Fields itself was also badly hit during the Blitz, which ultimately led to the new landscaping of the site in the 1960s by Peter Shepheard and an extensive restoration of the remaining memorials. This saw the graves in the southern area fenced off and a large, green open space created in the northern section. The cemetery itself had been closed to new interments back in 1854 – it was declared to be well and truly ‘full’ after receiving something in the order of 123,000 burials. The Abney Park Cemetery in Stoke Newington was to become the next cemetery of choice for nonconformist citizens. October to March: weekdays 7.30am – 4.00pm, weekends & bank holidays 9.30am – 4.00pm. April to September: weekdays 7.30am – 7pm, weekends & bank holidays 9.30am -7pm.